"Here the loyal assemblies obeyed the Crown. Here the spirit of Liberty was aroused and guided by the eloquent appeals of Otis, Adams, Quincy, Warren, and Hancock. Here the child of independence was borne. Here Washington received the tribute of an enfranchised people. And here was installed the government of a new state." Much history occurred in the council chamber on the east side of the Old State House building. In provincial days, the Honorable Council of Boston, composed of prominent citizens and loyal friends of the King, met in this room. From the balcony of its large east window, it was customary to announce to the people when a new Royal Governor assumed office, and to proclaim with the beat of a drum and blast of a trumpet when a new Sovereign had ascended to the throne of England. In 1760, King George III ascended the throne, and soon after Thomas Hutchinson was made governor. Events regressed after the Revenue Acts were passed by the English Parliament, and culminated with the Boston Massacre on March 5, 1770. It was from the east window of the Old State House Boston that Governor Hutchinson addressed the people on that occasion, and ordered them to disperse. The next day, Samuel Adams and a committee of 15 citizens, requested that Hutchinson remove his troops to Castle William for safety reasons (where Fort Independence in South Boston now stands). The soldiers were moved on March 10-11, 1770, and render this chamber historic as the scene of the first concession obtained by the colonists from the Crown upon the eve of the struggle for independence. In 1774, Thomas Gage succeeded Hutchinson, the last of the Royal Governors, and on his recall, General William Howe was appointed to command the military force encamped in Boston, who held control until the evacuation of the town in March, 1776. The Declaration of Independence was read from the East window of the Old State House Boston on July 18, 1776, and in 1780, upon adoption of the State Constitution, was formally inaugurated John Hancock as the first Governor of Massachusetts. 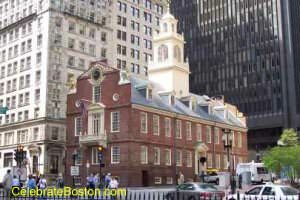 The Representatives' Hall is at the west-end of the building of the Old State House Boston. In 1761, James Otis Jr., delivered a memorable plea against the Writs of Assistance, and later registered the protest against the imposition of the tea tax. In April 1765, notice was received of the passage by Parliament of the Stamp Act. In October 1765, here for the first time in public life, as a Representative of the town of Boston, was Samuel Adams. The House of Representatives last occupied this room on January 11, 1798, when the Legislature marched in procession to the new State House on Beacon Hill, then completed. The Sacred Cod was moved to the new structure. The symbolic lion and unicorn of the British arms remain on the building to this day.